Accessory and peripheral maker MacAlly has introduced four new mice aimed at Macintosh users—although, of course, the devices also work perfectly well with PCs. The Accuglide is a low-profile USB mouse offering two buttons and a scroll wheel, along with 800-dpi resolution and optical sensor safeties for high-precision control. 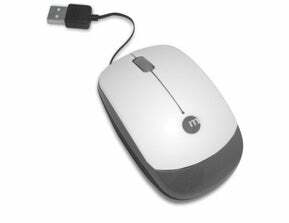 For notebook users, MacAlly is offering the Turtle, an 800 dpi, two-button device featuring a USB cable that neatly retracts inside the mouse. For power pointers who can't get enough buttons, MacAlly is also offering two five-button devices: the Pebble and Pebble Wireless. The USB Pebble features a programmable four-way scroll button with tilt-wheel technology and selectable resolution from 400 to 1,600 dpi. The Pebble Wireless is much the same as the Pebble, but with a 2.4 GHz IR system eliminating the USB cable. The Pebble Wireless also features a swivel cover that can hide its IR receiver when not in use. The Accuglide, Turtle, and Pebble are priced at $19.95, while the Pebble Wireless carries a $29.95 price tag. All four mice are available now.